Jafraisa, Mariu and Alejandra. Muria’s parents both died of AIDS, but she’s been adopted into a Christian family. Haiti shares the Caribbean island of Hispaniola with the Dominican Republic. 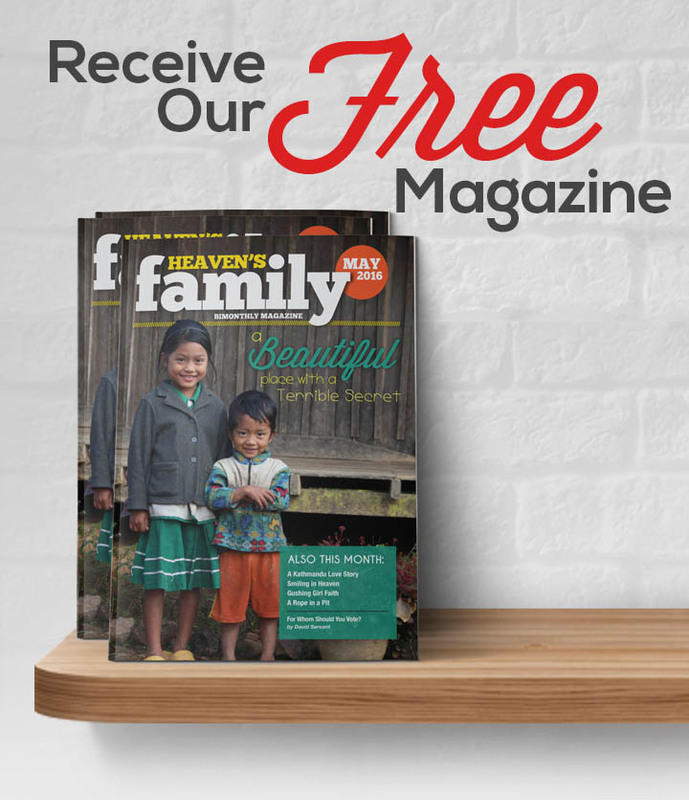 Heaven’s Family is working in both nations to help the poor among our family—especially widows and orphans—and equip pastors. This newsletter contains short reports of my visit to both countries in early January, as well as news of Heaven’s Family’s work elsewhere last month. Space allows me to tell only a fraction of all that was accomplished in January because of your partnership. On behalf of those who benefit from your kindness, thanks so much. Pastor James Jones, holding David, who lives in one of the beachfront “houses” on the left. David has been adopted by a very poor Christian family there after he was abandoned by his parents. Pastor James Jones, who now lives in the Dominican Republic, used to make his living trafficking drugs and laundering money. Late one night, however, he found himself in the middle of a sugar cane field about to be executed—by corrupt police who wanted to extort some of his profits. He decided it was time to re-evaluate his life. A providential cell phone call spared him, and God got his attention. That was in 1996. Today I’m with pastor James in a place where you wouldn’t expect to find this former U.S. Navy medic and med school grad. We’re in a squatters’ settlement named Playa Oeste, or “West Beach.” There is no way to describe West Beach by Western benchmarks. One-room shacks—built of rough concrete blocks, salvaged lumber and tin sheets—are crowded side-by-side. The streets are mud. The beach is covered in several feet of trash. Everyone drinks from shallow wells, drawing the water using plastic buckets on ropes. Surely God did not intend that anyone ever live in this kind of place. But the material poverty is just a veneer that hides an even darker spiritual underside. Drug deals are cut in the open here. Alcoholism, prostitution and gambling are equally visible. Most young women who call Playa Oeste home are “married” by age fifteen, but you don’t see too many men around. Children are sent out to work each day to help broken families survive. They couldn’t attend school if they wanted to, because they don’t have birth certificates. Neither do many of their parents. As far the as Dominican government is concerned, these people don’t exist. God, however, is still in the redemption business, and He is extending His merciful hand. Five years ago He sent pastor James and his wife Maria here to plant a church. West Beach, however, is not a place where you can just preach the gospel. It must also be lived. So James and Maria started a free Christian school for kids age 4-12. Each weekday, eighty-five children come to learn how to read and write—and how to follow Jesus. And adult hearts have softened. So far, three house churches have been planted in West Beach, and each one is like an oasis in a cesspool. Lives are being transformed. 62-year old Mercedes Martinez, who once ran a brothel in her shack at West Beach. Since her repentance and rebirth, a church regularly meets there. She’s been faithful under persecution. She is holding her great grandson. Pastor James’ school formerly consisted of two small buildings, but in December, tropical storm Olga destroyed one of them (a small feat). I told James that God was just clearing out the old to make way for the new. Heaven’s Family is providing funding, and construction has started on a brand new school/church/community center where the light of Jesus will keep shining in a very dark place. Pastor James oversees a total of twelve house churches in northern Dominican Republic. His ministry is also placing orphans and unwanted children in the homes of his disciples. Beyond that, he is helping Heaven’s Family distribute the Spanish edition of The Disciple-Making Minister to Christian leaders in the Dominican Republic, Chile, Columbia and New York City. Currently, pastor James is using TDMM to help train all his house church leaders. The first mission trip of my life, almost thirty years ago, was to Haiti. It was then that I first realized that I had been living in a bubble world. The poverty stunned me. Since my first visit—and many thereafter—it appears to me that Haiti has declined even more. Although the political strife has calmed under a very visible U.N. peace-keeping force, the fallout from years of lawlessness has taken its toll. One casualty is ten-year-old Edwige Pierre. Edwige tragically lost her father to an auto accident. Then, just two years ago, her mother was murdered during indiscriminate political killings. Thankfully, Edwige was taken in at Mt. Carmel Orphanage—overseen by an old friend of mine, a pentecostal pastor named Geordany. Because Mt. Carmel Orphanage is in a remote part of Haiti, a four-wheel drive truck was needed to get me there. We had to negotiate bone-jerking dirt roads and plow across bridgeless rivers. It took us six hours to travel seventy-five miles! But it was worth it to visit Edwige and the other nineteen children living at Mt Carmel. They are all so precious. Pentecostal Christians in Haiti like to dance before the Lord, and during the one fast song at a church service at which I spoke, the orphans of Mt. Carmel were first to hit the aisles! I was blessed to leave pastor Geordany funds for purchasing ten new bunk beds for his children, as they were sleeping two in a twin-size bed, and quite a few were sleeping on the floor. We’ve also adopted one other struggling Christian orphanage in Haiti in the capital city of Port-au-Prince. Three of the children’s portraits are below. You can find more at Orphans Tear. Chrislande Delice, Marc Jeverson Richard, and Yveline Jean Francois. Yveline has congenital albinism, having little pigment in her skin, hair and eyes, a condition that appears in one out of 17,000 people. Yveline’s eyes are extremely sensitive to light. Other projects are in the works in Haiti. The Disciple-Making Minister has been translated into French, and we are now in the preliminary stages of having it printed in Haiti for eventual distribution to thousands of Haitian pastors. Last month Heaven’s Family provided a total of eight cows for four Christian widows in Sri Lanka. Also provided were temporary shelters, and in some cases, small business start-up capital for seven Christian families who are Sri Lankan civil war refugees. They had lost everything. Below are photos of three of those families who have benefitted. What we witnessed on the roads yesterday was so terrifying….horrible things, burnt bodies laying by the road side, massive property destroyed, vehicles burnt…houses destroyed, the situation is very bad….People are suffering. At the refugee camp we visited, there is only one toilet, a pit latrine. Nearly 2,000 people are sharing one toilet. The problem is big. We are praying for wisdom as to how to approach the issue of ethnic anger. The camp we are assisting has people from ten tribes. We have asked them to forgive each other and embrace love. There is so much anger. Becky and I will be traveling around Texas February 1-10 visiting old and new friends and sharing the Word. If you live anywhere near Dallas, Mabank, Lindale, Corpus Christi, Austin or Schulenberg (half-way between Houston and San Antonio), we’d love to meet you! Just send us an email. Let us know what location you are interested in. Three others from our staff are heading in February to various places in India. Chuck King will be serving Christian leaders in the state of Tamil Nadu, while CJ and Charity McDaniel will be bringing relief to persecuted believers in Orissa State, and to orphans, widows and other poor believers in Kerala State. Your prayers for all of them are appreciated. 2008 is looking like a great year for investing in the Heaven’s Family Mutual Fund. It goes up even if the economy goes down! You learn more about the heavenly returns with the Heaven’s Family Mutual Fund online. As always, it is an honor for us to serve you as you serve “the least of these” among Christ’s family and so prove your faith in Him. Have a blessed and fruitful February. Due to the depth of poverty in Playa Oeste, some small children literally have no clothing to wear. But it doesn’t seem to bother them!